The Odalys City Apart’ Hotel Bioparc, of modern architectural conception, is situated in the 8th district of Lyon. It comprises 133 bedrooms, in a 5-storey building, studios and en-suite apartments with 2 rooms, all fully equipped and tastefully decorated. 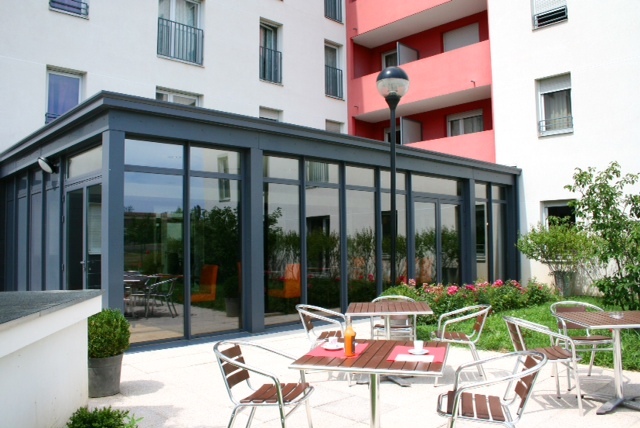 The Odalys City Apart’ Hotel Bioparc has two private car parks (one outdoor and one indoor), while the town centre on the peninsula of Lyon is easily accessible, just a 15-minute journey by tram or underground. Situated in a peaceful, residential area, close to the prestigious cultural centres, such as the Maison de la Danse, the Institut Lumière and the Tony Garnier Urban Museum, the hotel is also at close proximity to Lyon’s main hospitals and just an 18-minute tram-ride (T5, leaving from the station Ambroise Paré, at a 5-minute walk) from the Eurexpo exhibition centre.